You came here to finish The Doppelganger Quest. 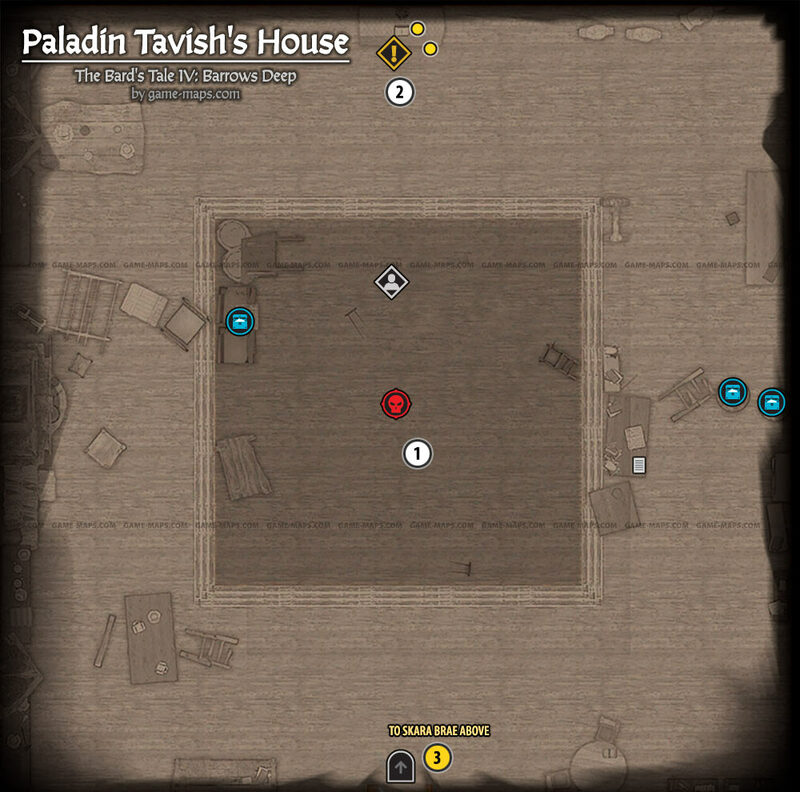 Kill Imposter and talk with Paladin Tavish. ELVEN WILES Wringneck and Dalgliesh want help finding their friend the Green Lady, who was on the trail of a kidnapper. They think she might be near the docks. Mercenary Tokens you will get is as a quest reward. You can use is in Old Adventurers' Guild to create new party member. Location a description of the location. The order of numbers is the order in which you shoud explore the map. Exit or Entrence from location to another map. NPC - One or More Interactive NPC, having at least the ability to talk. Luck Stones - they will allow you to save game, if you die you will reappear at the last Luck Stone you visited. Ancient Luck Stones are a special type of Luck Stone, you may choose to save game here or, you can instead consume it gaining Experience points. Shrine Standing Stones of Gratitude are ancient monuments to great heroes of Skara Brae. Interact with them to gain bonus experience. Party Member - possible member of your party if you recruit him. Item Quest Starter - item or place, not NPC that starts the quest. Quest Items - items required to complete quests. Vendor - Shops, here you can buy and sell weapons and equipment. There are different types of sellers. Entrance / Exit that does not require additional activities. Key Locked Door - These doors require a specific key to open them. Cog Locked Door - These doors require you to solve cog puzzle. Some doors required missing Cogs. Rope Entrance - You need Grappling Hook with Rope to open this Entrance. Burnable Barrier - Use Dragonsbile Bomb to clear way. Closed Chest - You have to unlock it first. Requires training in Lockpick. Open Container - this container is open, you can take its contents. The contents of crates and containers are random. Throw's Secret Sign - Rune on the wall, here you have to use Hidey Bide (Ability Song) to reveal hidden stashes nearby. Hidden Throw Stashes - You have to use Hidey-Bide (Ability Song) to reveal hidden stashes. Stone Remembers - you have to use The Stone Remembers Song here to rebuild structure. It also reset block puzzles. Monsters Solo monster or group of monsters. Boss Monster Here you will find a monster that is stronger than the other enemies surrounding you on this level.